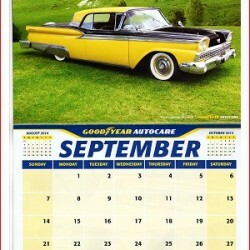 Classic Car Photography is proud that our photo of a Ford Galaxie Skyliner features as the September 2014 car of the month in the 2014 Goodyear Autocare calendar. This photo of a Ford Galaxie Skyliner was taken at the Shannons/AOMC American Motoring Show at Flemington and although we’re not always fans of “yank tanks” this yellow beauty certainly caught our eye. We have to admit though that the wonders of Photoshop have made our original image look a little different in the Goodyear Autocare calendar. The Ford Galaxie was a full size car built in the United States by the Ford Motor Company for model years 1959 through 1974. The name was used for the top models in Ford’s full-size range from 1959 until 1961, in a marketing attempt to appeal to the excitement surrounding the “space race”. 1959 saw the introduction of the Galaxie name in Ford’s model lineup at mid-year. That year, the Galaxie range of six models were simply upscale versions of Ford’s long-running Ford Fairlane with a revised rear roofline that mimicked the concurrent Thunderbird. In keeping with the era, the 1959 Galaxie was a chrome and stainless steel-bedecked, two-tone coloured vehicle. It was the very image of late-1950s American automobile excess, though somewhat tamer than its Chevrolet and Plymouth competitors. Among the models was the Ford Galaxie Skyliner, featuring a retractable hardtop that folded down into the trunk space; this feature, impressive but complicated, expensive and leaving very little trunk room when folded down, did not last long, being produced from 1957 through 1959. This last image is a favourite of ours and is available for purchase in a number of formats including greeting cards, posters, prints, etc. Prices start at less than AUD$3.00 (plus postage). Please Click Here to find out more.